With the growing rise of WordPress blog themes, Spacema stepped into the fray with their theme in this market named Elena. Elena is a large WordPress theme designed to help you create many different types of blogs using just the one WordPress theme. Elena is a professional and highly customizable WordPress theme for blogs. 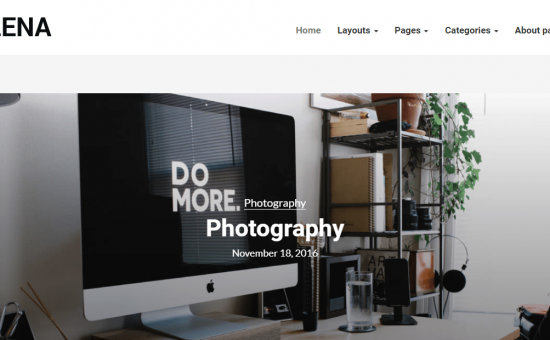 It is clean, modern and simple to use WordPress theme. This theme was created with attention to detail it has lots of options neatly organized into sections. So Elena theme allows you to create your own blog without any coding knowledge. Before we look at how the theme functions, let’s take a look at features are included in Elena WordPress theme. 12 Different Home Layouts – depending on your preferences you can choose among 12 home layouts. Google fonts – through the admin panel you can change styles of all fonts of the website. Live Customizer – Using WordPress Live Customizer you can preview the changes made to your WordPress website in real time before pushing them live. Customizable coloring options – change website colors to any color you want. Elena theme has a detailed panel where you can set the main options for your website. Under the Typography tab, you can select the main typography options for your site. You can change all options for h1 – h6, links, and text. Also, this theme has powerful options for color. So you can change color for all elements on the website. Also, you are given the option to install demo content ñ if your using installation of WordPress we recommend you do this step. So you will get ready to use website.